More years ago than I care to admit, I ran a Battletech miniatures campaign for five years. For the uninitiated, Battletech is a game of mech combat, with a deep rules set and set in a richly created universe loosely based on the fall of the Roman empire. A typical game might encapsulate a 12 vs. 12 mech skirmish and would take a good eight hours to play – not counting setup and tear down. These days, I rarely have a full day to dedicate a full day to playing one miniatures game. So when I heard Roadhouse Interactive was developing a browser-based implementation of the old Battletech board game, I felt compelled to check it out. Nvidia hosted a Mechwarrior Online tournament in Santa Clara on Friday, July 27th, which was fine – I played most of the Mechwarrior PC games and love stomping around in a giant battlemech shooting up other mechs. But Mechwarrior Online is more a sim – you’re the mech pilot. 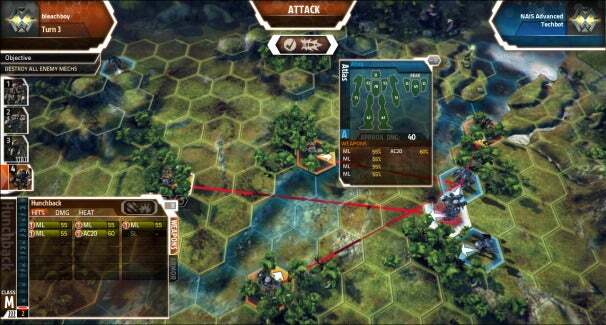 Mechwarrior Tactics is the top-town strategy game, where you play the mech commander. During the Mechwarrior Online event I ran into James Romanchuk, producer for Mechwarrior Tactics, which was fully playable on four PCs in a small room off the main tournament hall. My friend Scott Crandall and I sat down for a session, but before diving in, James sat down and walked us through all the setup. Since Mechwarrior Tactics will be free to play, the game features many of the tropes of F2P games: You start out with some basic mechs and gear, and as you play you can pick up additional gear by spending in-game currency you collect for successfully completing missions. Of course, you can always spend real money to accelerate the process, but if you’re patient enough (and play enough) you won’t have to. As you collect currency, you spend it on STACs – essentially expansion packs containing a random mix of “cards.” If you’ve played multiplayer Mass Effect 3, you’ll understand how it works – it’s much like the classic collectible card game model. After buying a STAC, you can open it to check out the contents. Your mechs have a base set of gear, but the gear you acquire in STACs may contain better stuff. In fact, there are dozens of weapons manufacturers and weapon types, much like the huge variety to be found in the RPG-esque shooter Borderlands. Some weapons may offer improved chance for a critical hit; others may generate less heat. Still others weigh a little less, allowing you to mount more of them in one of your mechs. Once your unit is configured, it’s off to the battlefield, where you’ll fight other lances. You’ll start off in a PvE environment (you versus AI-controlled units), but as you gain experience, better gear and a reputation, you may start encountering other human-controlled units. Mechwarrior Tactics is turn based, but with a twist: you issue orders, as does your opponent. When you’re both ready, the orders execute in real time. First, you’ll tell your mechs who to attack. After issuing attack orders for all your units, you then declare movement. When that phase is done, and your opponent is ready, all the orders execute in real time. Each set of orders represents a few seconds of actual combat. You get to watch events unfold onscreen, but have no control until the end of the phase, similar to games like Combat Mission or Laser Squad Nemesis. I sat down with a friend and played through an entire combat encounter. The user interface is slick, and works well. So far the only complaint I have is that the popup when issuing movement orders sometimes obscures enough of the underlying hex that it’s tough to actually click on the hex. Mostly though, the user interface is intuitive to use and works well. During our encounter the lance I commanded offered a mix of slow, heavy mechs and fast, jump-capable light mechs. Here's a cool thing: my past experience with the Battletech board game translated very well to the web-based version. Familiar tactics, such as using jump capability to get into the enemy’s rear, using hills and trees to gain combat advantage, and moving through water to minimize heat all behaved as expected. After playing through one battle, I’m definitely looking forward to playing more Mechwarrior Tactics. The game is scheduled to ship before the end of the year, and it’s on a short list as one of my most-anticipated games of 2012.